Legendary NBA player and best-selling author, Kareem Abdul-Jabbar, visited The William Bodine High School for International Affairs in Philadelphia, for a school assembly on February 15th. Nearly 300 students and faculty were in attendance at the program which included a question and answer session with the legendary sports icon and the NBA’s All-Time leading scorer. 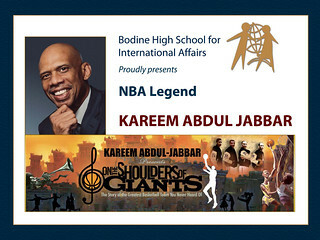 Kareem Abdul-Jabbar’s Skyhook Foundation, in conjunction with his alma mater UCLA and the National Council for the Social Studies, has selected Bodine High School as the only school in the tri-state region to partake in this special program which will focus on Kareem Abdul-Jabbar’s On the Shoulders of Giants – a film-based educational program designed to increase knowledge and awareness among US high school students of the impact of the Harlem Renaissance and its leading figures in sports, music, literature and history. The program coincides with Bodine’s celebration and observances of Black History Month.